We wanted to take this chance to showcase an item that is not widely known, but has a large appeal. Houseplants and certain potted plants outside dry up quickly without frequent watering. When we leave for vacation, these plants are often stressed more because we are not able to water them. We might put them outside and hope for frequent rainfalls to keep them moist. But that might be wishing for a lot, especially during the drier summer months! The Plant Nanny products make water easier and are a great solution for vacation watering. How the Plant Nanny works. Plant Nanny is made in 3 different styles, but the concept is the same regardless. 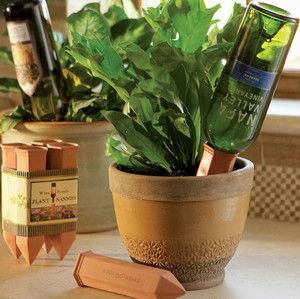 The uniquely shaped ceramic terra cotta spike is inserted into the potting soil and seeps water through its shell when needed. Instead of glass globes that leak out water at a specific rate, the Plant Nanny system seeps water only when it is needed. There are 3 styles to choose from: ones that connect to plastic water bottles, ones that use old wine bottles, and one that is in all inclusive system that includes a decorative glass reservoir. Where are customers finding them most useful? The Plant Nanny system can be used everyday and works great this way, because it promotes deep root watering. It will also not saturate the soil medium and create extreme wet or dry conditions. Instead, just keep water in the Plant Nanny reservoir and that is it! They work particularly well for hard-to-reach plants or ones that tend to dry out very quickly outside. Having the Plant Nanny installed in these situations, provides a safety net so that these potted plants don’t dry out so much to cause harm. Inside, the Plant Nanny works great for vacation watering. If you will be away for several weeks, let the Plant Nanny water for you! Just install one or two Nannies in the pot and you should be good to go. Stop in and see our full selection of Plant Nanny products in our Lawn and Garden Department.